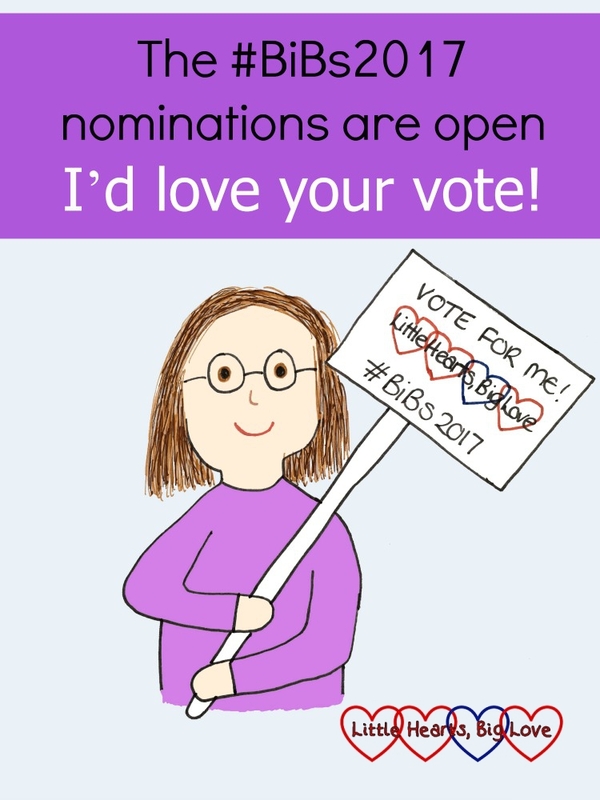 The #BiBs2017 nominations are open – I’d love your vote! It’s that time of year again: the start of the blogging awards season. Last year I was thrilled that my blog was shortlisted in the Family category of the Brilliance in Blogging awards (BiBs) and I’d love to make the finalists list this year. As a result, I’m indulging in a little shameless begging – if you enjoy reading my blog, I’d love it if you could nominate me in the Family & Lifestyle category and/or the Inspire category for the #BiBs2017. The Family & Lifestyle category is all about blogs that “share the laughter and tears of bringing up kids, inspire us to live better, or expose the (ahem) challenges of being a parent” as well as celebrating family life. This little blog of mine is all about sharing our everyday life as a heart family and raising awareness of congenital heart defects (CHD). I blog about the challenges that CHD throws our way, while focusing on positivity and just enjoying the everyday moments. My daughter might live life with half a working heart, but it doesn’t stop us enjoying family life to the full. By sharing our story, I hope to help others feel less alone in the journey and give hope to those who are just setting out on theirs. Inspirational is a word that has been used occasionally to describe my family. In all honesty though, we’re just a family getting on with our life because that’s all we can do. I try to focus on the positives, and share a photo of something I’m thankful for each day on Instagram as part of my #365daysofgratitude challenge. While my focus is mostly on the positives, I also try not to sugar-coat our life. I’m incredibly thankful to have my two beautiful girls but that doesn’t mean I don’t find parenthood exhausting, overwhelming and challenging at times! Click here to go to the #BiBs2017 nomination form and scroll within the box to fill in the nomination form. The Inspire category is at no. 6 and the Family & Lifestyle category at no. 13. URL of your favourite post: choose your favourite or you can pick from one of the suggested posts below. What about the other categories? Thank you for including me in your line up, you’ll get a vote from me; I love your blog and all the wonderful family outings you embrace with your husband and gorgeous girls. Awesome lead picture by the way! Thank you Mel. They’re open until 7th June so there’s still time!